Heat oven to 250°F. Generously butter 9-inch pie pan. In large bowl, beat egg whites and cream of tartar until frothy. Gradually add 3/4 cup sugar 2 tablespoons at a time, beating at high speed until sugar is dissolved and stiff glossy peaks form, about 8 to 10 minutes. DO NOT UNDERBEAT. Spread meringue evenly over bottom and up sides of buttered pan. Bake at 250°F. for 1 hour. Turn oven off; let meringue crust cool in oven with door closed for 2 hours. Meanwhile, in medium saucepan, combine 1 cup sugar and cornstarch; mix well. Gradually stir in lemon juice until smooth. Cook over medium heat, stirring constantly, until mixture boils; boil 1 minute, stirring constantly. Remove from heat. In small bowl, beat egg yolks; stir about 2 tablespoons hot mixture into egg yolks. Gradually stir yolk mixture into hot mixture. Cook over low heat, stirring constantly, until mixture boils. Boil 1 minute, stirring constantly. Remove from heat; stir in lemon peel and food color. Cover surface of filling with plastic wrap. Cool 45 minutes or until completely cooled. Fold whipped topping into filling. Pour into cooled meringue crust. Refrigerate at least 3 hours or overnight. If desired, garnish with thin lemon slices or grated lemon peel. This meringue shell is crisp and dry. 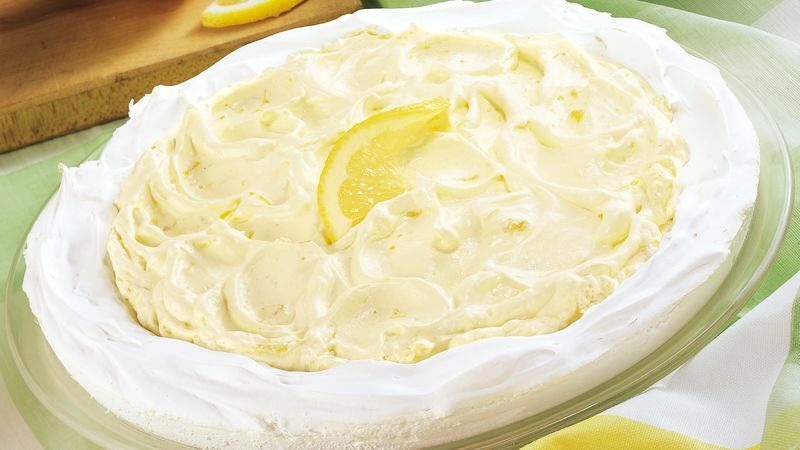 The moist filling slowly softens the meringue, making the pie easy to cut and serve the following day. In our testing, we baked the meringue in both a metal and a glass pie pan. The metal pan produces a drier meringue; the glass pan looks nicer for serving purposes. Meringue will not dry properly when the humidity is high. Garnish slices of this pie with thin lemon slices set on fresh mint leaves.